Ringstead Bay remains an almost forgotten gem along the Dorset Coast. Despite the obvious beauty of the location, the site has never been commercialised. Private ownership of much of the land has prevented companies, such as Pontins or Butlins, from exploiting the area in the past and Ringstead Bay remains much unaltered. The winding lane leading down to the bay is certainly not conducive to heavy traffic. Nowadays, the area is under the care and ownership of the National Trust and despite a fairly busy scene around the beach café and car park on Sunday, the rest of the large bay was characteristically mostly deserted, even on a blisteringly hot summer day, as we found out! A few hundred yards away from the slipway and the peace and tranquillity of Ringstead Bay becomes apparent. A brief talk, by Steve, set a backdrop to the location; the geology, the fossils and the Jurassic coast. The group gathers for an introductory session. Some of the group, with the Isle of Portland in the distance. To the west of the bay, the harder rocks of the Corallian sequence form the headland of Bran Point, composed mostly of the Osmington Oolite Series and packed full of the large cockle Myophorella clavellata, which are also evident in the reefs and rock pools at low tide. To the east, the majestic Chalk cliffs of White Nothe form a prominent cliff. In between, the tall, slumped and badly weathered cliffs within the bay are entirely composed of Kimmeridge Clay, which is where our hunt began. View across the bay, looking west. The Kimmeridge Clay here is 151 to 156 million years old and is composed of much degraded mudstone, formed on the Jurassic sea bottom when England once bathed in a sub-tropical climate. In fact, it was probably much the same as the day of our hunt, where the sun shone fiercely and the sky and sea were blue and mostly cloudless. After an introductory chat, explaining the geology of this part of the Jurassic Coast, the party descended to beach level and the hunt was on. Ringstead Bay suffers much the same as other locations at the height of summer; poor erosion from tides and rain and from tourists. The tourists love fossil hunting in Dorset and consequently the more usual specimens found at Ringstead Bay were in short supply. Local collectors wait for the autumn and winter storms to help stir up the coast replenish supplies of fossils. However, the recent lack of good storms, even over the winter, has also meant fewer cliff falls and fresh material being exposed. The Kimmeridge Clay here was very dry and finding fossils within the hard clay body was not easy. However, the first fossil – a piece of the oyster, Deltoideum delta- was found by 6-year old Sophie de Candole. This was followed by several large complete oysters of the same being picked up by most members of the group. Pieces of hard shale, which could be easily split by hand, exposed several ammonites and various shells. The largest ammonite remained in an immovable boulder on the beach but Aaron Roberts, aged 11, found a nice smaller specimen. The Sandsfoot Formation, which marks the junction between the older Corallian rocks with the overlying, younger Kimmeridge Clay was exposed in the cliff and formerly known as the Ringstead Coral Bed. Broken ‘chunks’ on the beach revealed little in the way of fossils, although 12-year old Cem Izzet found a good-sized bivalve, named Ctenostreon proboscideum. whose large strongly-ribbed shell is unmistakable and easily recognised. Halfway along the bay, high in the cliffs, are the visible strata of the Portland Limestone Formation and capped by the basal part of the Cretaceous Purbeck Formation. The folded and faulted rocks, form a spectacular unconformity, with the Chalk dipping to the right and the Portland and Purbeck rocks dipping towards the right. The day was certainly a success. The majority of the group found various fossils and were very pleased with the outcomes. Coupled with the glorious weather, it was a wonderful day out and encouraged those who had never been to the location before, to return. 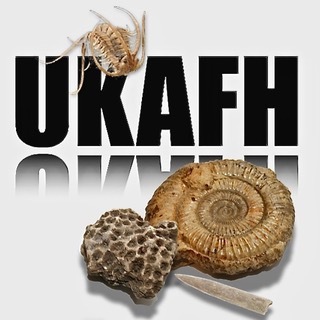 Many thanks to everyone who came along and UKAFH look forward to seeing you on another hunt. This entry was posted in Reports and tagged Chalk, Corallian, dorset, dorset fossils, fossil hunt, Fossil Hunting, fossils, Kimmeridge Clay, Osmington Oolite, Portland Limestone, Purbeck Formation, Ringstead, Ringstead Bay, ukafh.